The 23rd Blue Mountains Music Festival was a musical feast held in glorious autumn weather. 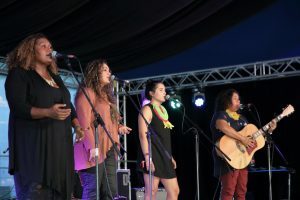 Acts ranged from local heroes Missy Higgins and Archie Roach to rising stars Blair Dunlop and Susan O’Neill plus Afrobeat from Melbourne and English bluegrass. Words and pictures by Steve Ford. 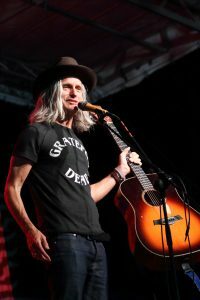 After the literal fire and flood 2017, the weather gods smiled on Katoomba, with not a drop of rain during the 2018 Blue Mountains Fest. On paper, the line-up looked solid across the board, and so it was. With quality acts on all stages, good management or good luck was needed to make the most of the weekend. Highlights for me included the irrepressible Steve Poltz, young English folkie Blair Dunlop, Lamine Sonko’s Melbourne-based Afrobeat band, and Scotland’s trad quintet, Breabach. Ireland’s SON (Susan O’Neill) had the honour of opening the main ‘Big Top’ stage. 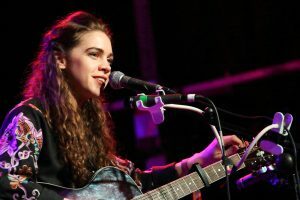 Despite a long delay and significant sound issues during the performance, she won over the early crowd with her voice, musicianship and – not least – composure. Performing solo with live looping, she is an arresting performer. I was slow in discovering All My Exes Live In Texas, whose When The Sun Comes Up has had two million hits on Spotify, and was looking forward to seeing them for the first time. 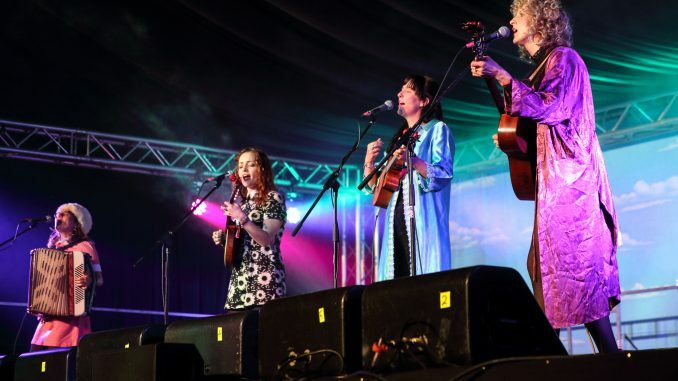 A quartet of four Sydney singer-songwriters – Elana Stone, Katie Wighton, Hannah Crofts and Georgia Mooney – they have distinct voices blending into gorgeous four-part harmonies, making the group greater than the sum of its parts. 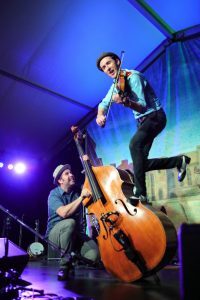 They have tapped into the Americana zeitgeist without cliché, making the most of an unusual combination of guitar, ukulele, mandolin and accordion. Elephant Sessions are a young Scottish quintet, blending trad folk with a little electronica and a rock rhythm section. They put me in mind of their countrymen Shooglenifty, but have more bottom end. They may lack variety, being all instrumental, but sure had the late night crowd up and dancing. 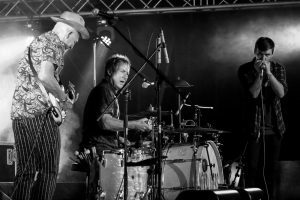 I’ve been around so long I think of the current incarnation of The Backsliders as a new group, and I was mildly shocked to learn Rob Hirst (of Midnight Oil) has been in the drum chair since 2000. Like Chris Wilson, their “delta blues wall of sound” is one of the reliable constants of the festival circuit. They work hard, never phone it in. 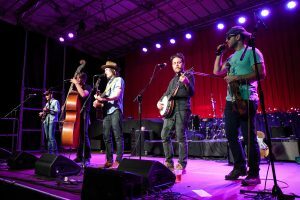 Americana string band Brothers Comatose hail from Texas via San Francisco. The Big Top crowd had thinned by their 10.30pm start time, but those not exhausted by Elephant Sessions were on their feet. Difficult to pigeon-hole, they fuse elements of country, folk and rock. Perhaps their most popular song – and certainly one of the highlights of their set – is a cover of Amy Winehouse’s Valerie. The morning workshops are a highlight of Blue Mountains Fest for many – mainly hardy souls who retire early or can somehow function without sleep. I’m not normally one of their number but made an effort to join this deconstruction of bluegrass music with Flats and Sharps. Bluegrass from Cornwall? Why not? These guys got together as teenagers and have developed serious chops, with banjoist Kirk Bowman the standout. My plan was to get pictures of Steve Poltz then head over to the English folk duo of Josienne Clark and Ben Walker. Poltz came on and spoke for ten minutes or so about ‘Old Smokey’, his stage guitar, before playing a note. I was transfixed, and stayed to the end. Poltz is, without doubt, a genius. He riffs on familiar autobiographical themes – meeting Elvis in Palm Springs, the Blue Jays winning the World Series – but no two shows are truly alike. It’s a light speed rush of rich anecdote, random thoughts, audience interaction and song. The music can seem almost incidental at times, but Poltz is a very fine singer. This set peaked with Dylan’s Not Dark Yet, sung in tribute to the late Jimmy Le Favre. Indigenous legend Archie Roach followed Mission Songs on the Pavilion stage, but I bailed early for Blair Dunlop at the Big Top. Although he had three sets over the weekend, this was Dunlop’s one shot on a big stage with superior sound. He made the most of it. Dunlop has matured remarkably since he was last here in 2014. A seemingly shy performer then, he now has an easy comfort with an audience and his singing is much the better for it. His songs range from quirky personal numbers to topical songs typical of English folk. His keen sense of melody and skill on guitar keep even the slightest of his songs interesting. This was one of few shows I watched from start to finish, and it was a highlight. I left KMH early to trek up the hill for 10 String Symphony at the Palais. I’m looking forward to the upcoming album by this Nashville duo of Rachel Baiman and Christian Sedelmyer – and was one of the 257 folks to cough up at Pledge Music help make it happen. That said, I didn’t enjoy this set nearly as much as Rachel Baiman’s show in January. The music is more challenging, for sure but, more to the point, it didn’t work well as entertainment, with Rachel mostly side-on to the audience due to a complex mic setup. 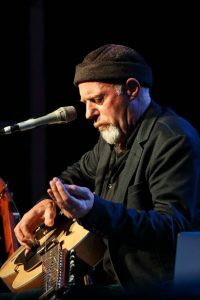 If 10 String Symphony was challenging, Harry Manx ‘s music is as comfortable as an old boot. He’s not playing much new material but this Big Top show included magical accompaniment by the Sydney String Quartet. It looked like the five on stage enjoyed this departure as much as the audience. After a 21 hour day on Saturday, I held back until the early afternoon for Lamine Sonko & The African Intelligence, a multi-cultural Melbourne band led by Senegal-born Sonko. 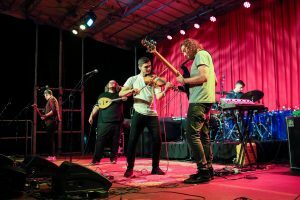 Given the part-time nature of the band and a constantly changing line-up, they delivered a stunning performance, combining West African music with reggae and funk. They are drum tight and bgreat to watch. 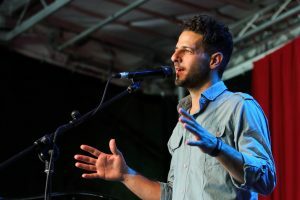 Lior has a hypnotic presence on stage. I’ve never been a big fan, but his gentle, articulate persona and lighter than air delivery draw you in. His collaboration with Paul Grabowsky works remarkably well, with some songs getting a near jazz treatment. Missy Higgins had the main stage and her one-off appearance (fresh from her tour with Ed Sheeran) drew the weekend’s biggest crowd. After cursing myself for again missing Josienne Clark and Ben Walker, I instead joined a handful of people to see Irish folk singer Pauline Scanlon, accompanied by John Spillane on guitar. 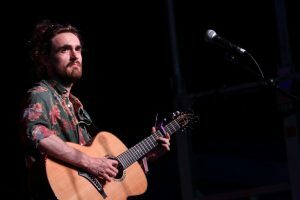 It was one of those strange moments you sometimes get near the end of a festival – a truly talented duo playing to a living room-sized audience. My festival ended with Breabach, the best folk band of the weekend. 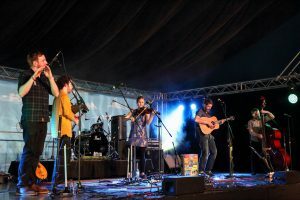 This five piece Scots trad band formed in 2005 and their experience shows in their both their musicianship and showmanship. The set builds slowly to a thumping climax, with Calum MacCrimmon and James Mackenzie both turning to the bagpipes to create a triumphant noise. It was an awesome way to end my festival, and I headed home on a high.